Septic systems are most commonly found in rural areas where municipal sewer services are unavailable. These underground wastewater treatment structures combine proven technology with natural processes to treat wastewater in a safe and sanitary manner. At Rowell’s Services, we offer expert septic services you can depend on. 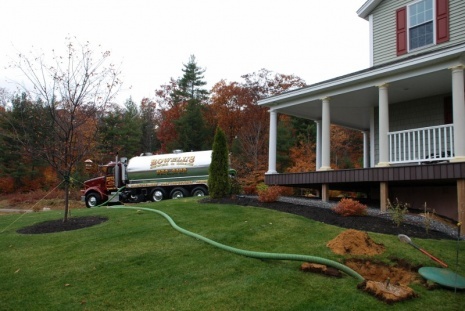 Thousands of customers throughout New Hampshire have come to depend on us for their septic service needs, and we would be honored to have you choose us as well. Most septic systems include a septic tank and some sort of drain field, most often a leach field. The tank digests organic matter and separates things like solids and oils from the water. The liquid is discharged into a series of perforated pipes in a leach field. Some systems may also use gravity or pumps to cause the fluid to trickle through sand or other media to neutralize or remove contaminants. When you take proper care of your septic system, it will likely provide you with several years of reliable service. Since these systems are so crucial to the proper functioning of your home’s plumbing system, it’s important to entrust their care to the professionals. At Rowell’s Services, we are experts when it comes to septic tank installation, maintenance, and repair. We are here to help you make sure your system stays in good working order, and we are available 24/7 if a problem arises. If you are in need of septic services, call 603-934-4145. Click here to check out our septic protection plan!